When Julio Urias was born on Aug. 12, 1996, Bill Clinton was in his third year in office, Independence Day had been in theaters for a month and "Macarena" was No. 1 on the U.S. Billboard Hot 100 chart. That was the year that consumer DVDs first hit the shelves in Japan, Atlanta held the Summer Olympic Games and eBay was launched. What were you doing when you were 16? You probably didn't strike out the side in your professional debut like Urias did Sunday afternoon. 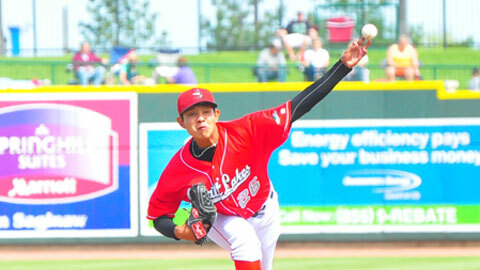 The Mexican teenager struck out six batters -- all swinging -- over three shutout innings in the Class A Great Lakes Loons' 2-1 loss to the Dayton Dragons. Urias struck out the first three batters he faced and he fanned Robert Ramirez as he worked around a pair of singles in the second inning. He fanned Brent Peterson and Joe Terry in a hitless third frame before turning things over to the bullpen. "I did a really good job for being only 16 in my first professional outing," the 5-foot-11 southpaw said through teammate Alan Garcia. "I felt pretty good. I was attacking on the first pitch with my fastball and I finished them off using the changeup and slider." The Dodgers signed the 160-pound left-hander last August, just 11 days after he became eligible on his 16th birthday. The Dodgers purchased his rights from Diablos Rojos del Mexico -- the Mexico City Reds -- of the Mexican League. As first reported by Baseball America, only part of his undisclosed signing bonus counted against the Dodgers' $2.9 million international cap. According to Baseball America, only around 25 percent of the overall fee to secure his rights -- the portion of the fee that Urias receives -- would count against the team's international pool. Added to the roster when right-hander Joel Lima was promoted to Double-A Chattanooga and fellow pitcher Ralston Cash was placed on the disabled list, Urias -- who would be a sophomore in high school right now -- turned a lot of heads in his debut. "[Julio] was extremely effective," Loons manager Razor Shines said. "He pitched three innings, attacked hitters. He looked a lot older than he is. We were very excited to see that from him. "We should've won the game today. We weren't as efficient as we should have been. We're working on some things, we're working hard and we're going to get better." He threw 35 of 52 pitches for strikes and held his own against hitters up to six years his senior. The Dragons' 23-year-old second baseman Joe Terry, whom Urias struck out twice, was in first grade when Urias was born. Terry was drafted by the White Sox while Urias was still in elementary school. "The first couple batters I was feeling nervous, but as the game went on I was feeling more confident with my pitches and I was trying to throw strikes," Urias said. "Coming to America ... all of the coaches in the organization have taken it step by step. I'm really happy with the organization for giving me the opportunity to pitch in this league." The average age for Midwest League pitchers this year is almost 22. To put Urias' debut into perspective, no other player in the league was born in 1996, and only two others (Clinton's Victor Sanchez and Lansing's Roberto Osuna) were born in 1995. The Dodgers could have started Urias off in the Dominican Summer League, which begins Saturday. Failing that, they could have opted to send him to either the Rookie-level Arizona League or to short-season Ogden of the Pioneer League, both of which gets underway three weeks later. None of the three alternatives would have seemed out of place. In 2012, the average age of pitchers was 19 in the DSL, 20 in the Arizona League and 21 in the Pioneer League. "My dream is to make it to the big leagues as soon as possible," Urias said. "I don't know what the plan for me is ... but right now I want to stay here and do my job. "I am really honored to come to the Dodgers. It was my dream to sign with a professional baseball team and the Dodgers had the biggest deal. I'm really happy because Fernando Valenzuela played for the Dodgers and I want to be the next Valenzuela." Ashley Marshall is a contributor to MLB.com. Follow him on Twitter @AshMarshallMLB. This story was not subject to the approval of the National Association of Professional Baseball Leagues or its clubs.